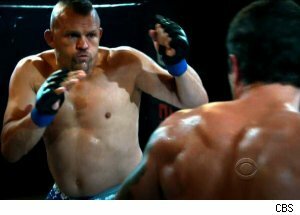 Chuck Liddell no longer fights in the UFC, but that doesn't stop him from throwing down in the cage. In an episode of Hawaii Five-O, Liddell is back in MMA action. Funny thing about this video, at one point Chuck's opponent does what very few have ever done: He takes the Iceman down. When Chuck's long list of KO victims watch this video, they will probably kick themselves for not bringing a choreographer with them to the fight. Check it out.